ConA activates T cells and NKT cells, which secrete cytokines, such as IFN-γ and TNF, that are known to be critical for liver injury in this model. Günther et al. discovered that IFN-γ signaling induces MLKL above a critical threshold (13). This increase in MLKL sensitizes hepatocytes to necrosis but alone is insufficient to promote necrosis and requires activation of MLKL. RIPK3 is the only kinase known to activate MLKL; however, RIPK3 is not expressed in hepatocytes or induced by ConA. Ripk3–/– mice given ConA developed liver injury, but Mlkl–/– mice were resistant to ConA. The RIPK1 inhibitor nec-1s was protective in ConA-treated mice, and this protection was upstream of MLKL activation. RIPK1 expression increased in this model and was independent of TNF or IFN-γ, occurring via an unknown mechanism. RIPK1 was found in a complex with MLKL, presumably with other not-yet-identified proteins; however, RIPK1 did not directly phosphorylate MLKL but possibly leads to the activation of the unidentified kinase activator of MLKL. 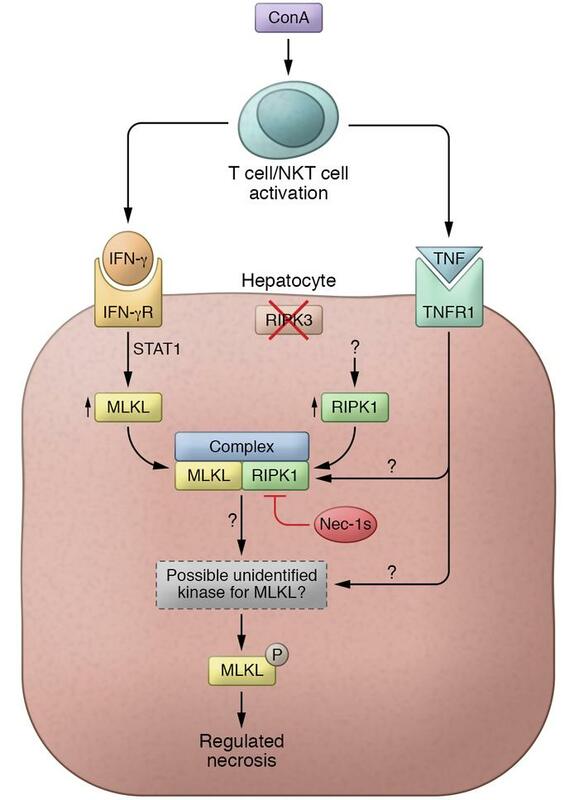 As TNF signaling is required for cell death, it must lead to the activation of either RIPK1 or the unidentified kinase to activate MLKL. IFN-γR, IFN-γ receptor; TNFR, TNF receptor.